The Cassini spacecraft continues to prove that the closer the view of the myriad worlds constituting the Saturn system, the more interesting and varied the views become. This close-up view of icy Dione reveals a wonderful variety of surface features that are simultaneously familiar and unlike any other place in the solar system. The terrain in this image is located within a 60-kilometer-wide (37-mile) impact crater along the feature called Padua Linea. The western rim of the encompassing crater runs from the middle left to the upper right. The crater's central peak can be seen at the lower right. Multiple generations of fractures are visible here. Numerous fine, roughly parallel linear grooves run across the terrain from top to bottom and are interrupted by the larger, irregular bright fractures. In several places, fractures postdate some deposits in the bottoms of craters that are not badly degraded by time. Such a fracture, for example, runs from the center toward the upper right. Most of the craters seen here have bright walls and dark deposits of material on their floors. 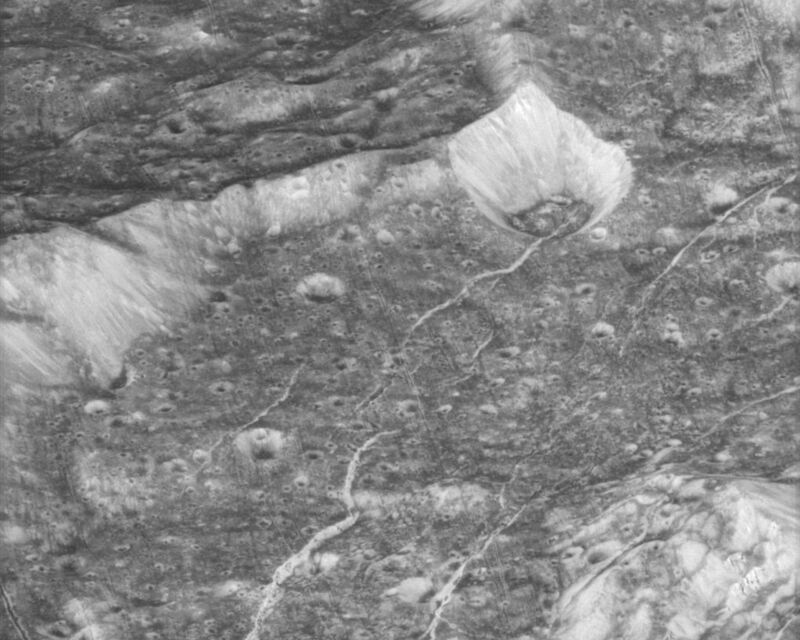 As on other Saturnian moons, rockslides on Dione may reveal cleaner ice, while the darker materials accumulate in areas of lower topography and lower slope (e.g. crater floors and the bases of scarps). 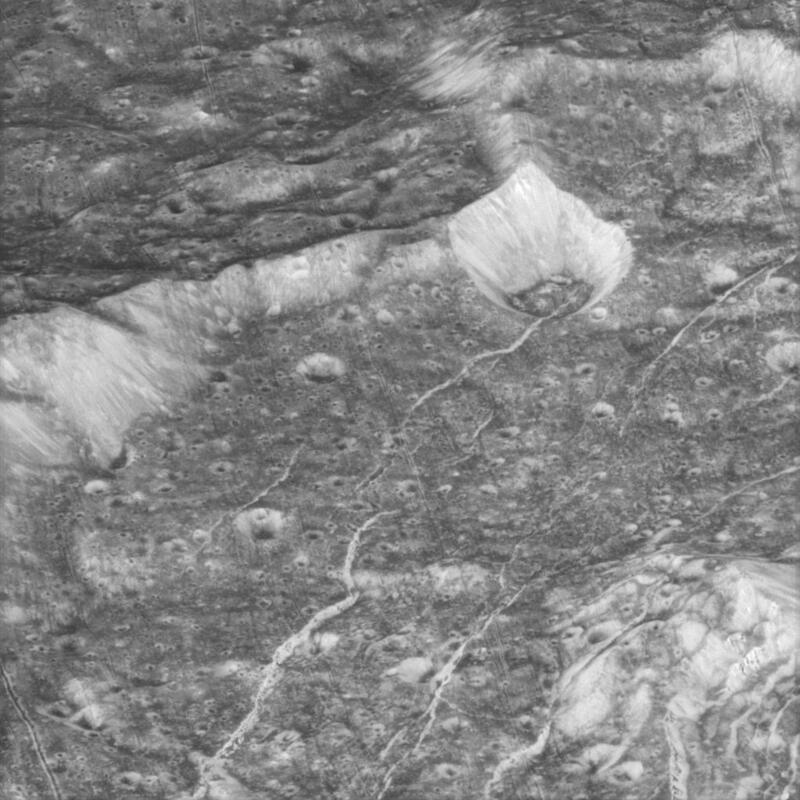 This clear-filter image was taken using the Cassini spacecraft narrow-angle camera on Oct. 11, 2005, during Cassini's close targeted flyby of Dione. 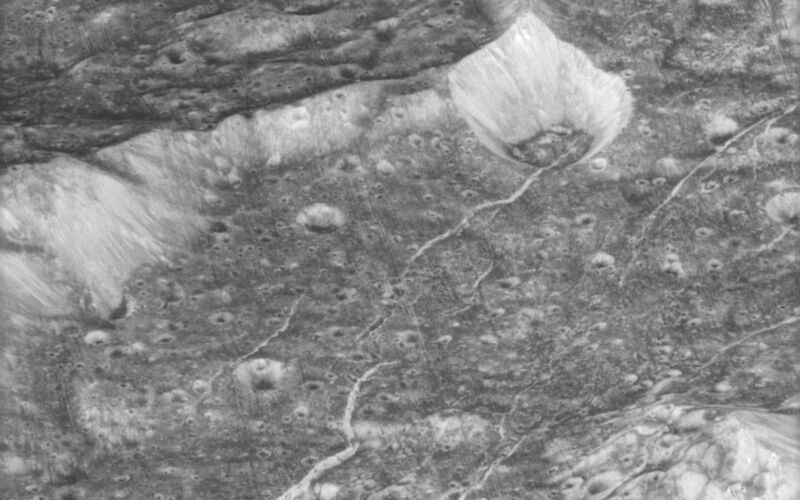 The image was acquired from a distance of 4,486 kilometers (2,787 miles) from Dione and at a Sun-Dione-spacecraft, or phase, angle of 10 degrees. The image scale is 23 meters (75 feet) per pixel.